Eesh. This is the first one of these that's really making me cringe. Some of the singing isn't bad (It's probably mostly one or two voice actresses, the cd does not identify them), but all the forced dialogue and lines referencing different characters are extremely awkward. Not too surprisingly, it's less awkward with characters from the more recent movies, when it sounds like the actual voice actress might be doing the song, rather than someone imitating an actress from one of the early movies. Whoever hired the voice actors for the seven dwarves and wrote their dialogue has a lot to answer for. A lot of the problem I have with this album, though, is the premise. There isn't one. So some songs are sung as a group, but most songs are very specific to each character and reference their own world. It seems stupid to me to put something like this together and not have some silly magic reason that all the princesses are throwing a party together, or something. Then they could talk to each other, instead of only ever talking to characters from their own movies, yet somehow singing together on other tracks without being in the same room. I don't know why it bothers me so much. I guess I just feel that something like this could actually be good, if anyone involved had tried. Ugh. The "Synthestrations" - yes, the CD liner says that - are just terrible. It makes everything doubly painful, but the music is especially egregious on Christmas is Coming (Snow White), Have a Holly Jolly Christmas (Snow White), and... okay, maybe all of them. I'm Giving Love For Christmas (Cinderella): Why are there little synthesized mouse backup singers? This song was the first one I was thinking: hey this isn't so bad - until the synthy mice came in, because then it's just hilarious for the wrong reasons. Silver and Gold isn't a terrible choice, actually. I mean, if you're going to make Pocahontas sing on a Christmas album for some stupid reason. At least they've edited out all the references to Christmas, and the end product, while not amazing, is at least tolerable. Ugh, the synth instruments on The Holly and the Ivy (Mulan) are completely hideous. My-ears-are-bleeding hideous. Which is especially annoying, because the singing isn't awful, and they've written a version without Jesus. I'm always on the lookout for a good un-religious rewrite of this song. I think this is the best version of A Christmas Waltz (Belle) that we have. I mean, that's not saying a lot, but it's fine. Christmas in the Ocean (Ariel) is terrible, but Ariel's Christmas Island is actually pretty cute. 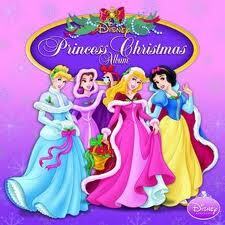 I was surprised that I kind of like Christmas With My Prince (Sleeping Beauty). For all the sappiness - and there is a lot of sappiness - it's trying to be a more grown-up romantic holiday song than anything else on this album, and it sort of succeeds. The Night Before Christmas is the least annoying of Snow White's songs. It's a zany patter song about all the chores they've neglected to do to get ready for the holiday. It's still annoying, but not bash-my-ipod-against-concrete annoying. Worst Songs: Holly and the Ivy, Christmas Eve Dinner, and any song with dwarves in it. Do not subject yourself to this. Really. Some sadist has put two tracks together on YouTube. Click, if you dare.